A TAIWANESE (台灣) flight with 58 people onboard turned on its side in mid-air, clipped an elevated roadway and careened into a river on Wednesday, shortly after take-off from the island’s capital of Taipei (台北), killing at least 31 people, local media and officials said. 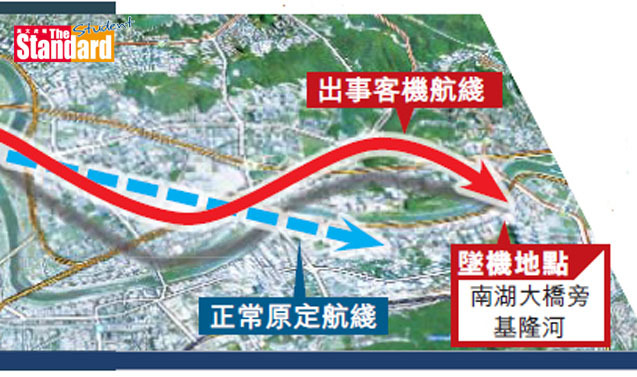 The death toll in the TransAsia Airways (復興航空) flight was expected to rise as rescue crews cleared the mostly sunken fuselage in the Keelung River (基隆河), a couple dozen metres from the shore. Teams of rescuers in rubber rafts clustered around the wreckage. The ATR 72 prop-jet aircraft was flying on its side, and one wing scraped Taiwan’s National Freeway No 1 (國道1號) just seconds before it plunged into the river, local television images showed. It was the airline’s second French-Italian-built ATR 72 to crash in the past year. Wednesday’s flight had taken off from Taipei’s Sungshan Airport (松山機場), en route to the outlying Kinmen (金門) islands. Civil aviation officials said the flight took off at 10.53am and lost contact with controllers two minutes later. Thirty-one passengers were from China, Taiwan’s tourism bureau said. Kinmen’s airport is a common link between Taipei and China’s Fujian (福建) province. Taiwan’s civil aviation authority said 31 people were killed out of 40 pulled from the fuselage and that 30 people were still missing. The plane’s wing also hit a taxi, the driver of which was injured, on the freeway just before it crashed into the river, Taiwanese broadcaster TVBS reported. Taiwan’s Ministry of National Defense (國防部) said it had sent 165 people and eight boats to the riverside rescue scene, joining fire department rescue crews. Speculation cited in local media said the plane may have turned sharply to follow the line of the river to avoid crashing into a high-rise residential area, but Taiwan's aviation authority said it had no evidence of that. Another ATR 72, operated by the same Taipei-based airline, crashed in the Taiwanese outlying islands of Penghu (澎湖) last July, at the end of a typhoon killing 48, for reasons that are still under investigation.